Injustice 2 has only been available since Tuesday, but players think they’ve already found its strongest–or possibly cheapest–character. 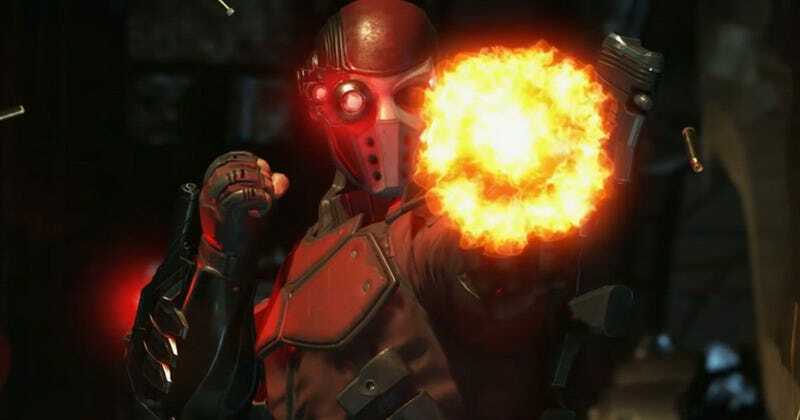 Deadshot, a frequent Batman villain whose sole power is that he can shoot well, brings a wide variety of firearms to NetherRealm Studios’ latest DC Comics fighter. Some players are already frustrated with his ability to win matches without landing a single close-range attack. Deadshot has had potential for controversy from the start because of how he plays. And that fuse was lit this week by the dominant fighting game player Dominique “SonicFox” McLean, who has been using Deadshot to snipe opponents to death. That performance provoked many fans to complain that the character is too cheap, but by week’s end it’s become clear that it’s really just a matter of perspective. Deadshot occupies much the same role as Deathstroke did in the first Injustice: filling the air with enough munitions to make a Second Amendment nut blush. In addition to the usual collections of punches and kicks, the assassin has access to several long-range specials, including quick pistol shots, crouching rifle blasts, and bullets that ricochet off the ground, all of which can be strengthened by spending some meter. He can also create a few scary 50/50 situations, wherein opponents must guess whether they should block low or high, but Deadshot doesn’t need to approach his prey to deal significant damage. Negative opinions of the character were already spreading through the community, and SonicFox’s exploits exacerbated them. SonicFox was always expected to do really well on Injustice 2 no matter which character he chose. He is widely regarded as the world’s best Mortal Kombat X player, but that doesn’t do justice the way he dominated that NetherRealm game’s competitive scene. Mortal Kombat X appeared at the Evolution Championship Series twice. SonicFox took first both times. Every big money event only contributed to the young competitor’s bottom line. According to eSports Earnings, which tracks these things, SonicFox has earned just over $250,000 from playing Mortal Kombat X since it first launched in April 2015. He’s kind of a big deal. Players who do well in Mortal Kombat can often transition those skills to its sister franchise, Injustice, and SonicFox has done that early on. During a release-day livestream on May 16, SonicFox utilized Deadshot’s strengths to destroy opponents online. Negative opinions of the character were already spreading through the community, and SonicFox’s exploits exacerbated them. Fighting game YouTuber XusesGB neatly compiled the competitor’s netplay matches, and it quickly proliferated on social media. Reactions to the video were so severe that a Twitter account known for highlighting “scrub quotes” made a massive collage of comments, ranging from simple distaste of Deadshot to hatred directed at SonicFox himself. When a fighting game first launches, a handful of character archetypes perform better than others. One of these archetypes is the zoner, who relies on keeping space between themselves and the opponent. Often, newcomers can become disenchanted with a release due to what they see as unfair strategies like spamming fireballs, giving up before taking the time to learn countermeasures. For high-level players, however, zoning is a key component of the genre they love. The keepaway game is as viable a tactic as, say, rushing the opponent down or setting traps. If it’s part of a character’s moveset, it’s fair game. This isn’t always the case, but for the most part, those who can deftly mix projectiles and aloof movement are typically heralded as strong players thanks to the scene’s “by any means necessary” approach to winning. While no one has denied Deadshot’s strength, top Injustice competitors encourage their fellow players to spend time in the training mode figuring out counters. This attitude was reflected on social media as the Deadshot conversation continued. While no one denied his strength, top Injustice competitors encouraged their fellow players to spend time in training mode figuring out counters. General options, like the new roll mechanic, can help players close the gap on zoners, and a few characters even have unique specials that can eat projectiles on approach (Bane’s Raging Charge with the Venom trait activated, pictured below) or even punish overzealous fireball users (Scarecrow’s teleport). Defeating online players with Deadshot is one thing, but taking him to an offline event is another, and the community was eager to see how SonicFox would perform at his first Injustice 2 event. They didn’t have to wait long. New York City weekly Next Level Battle Circuit welcomed Injustice 2 to the lineup last Wednesday, giving local competitors their first opportunity to show off what they learned in the young release. SonicFox took a break from finishing up his first year of college to travel to the heart of Brooklyn in the hopes of securing a part of the $1000 pot bonus tournament organizers raised through community donations. He didn’t disappoint, running roughshod over the high-level competition in attendance. The tournament’s runner-up, a strong Injustice player named Christian “ForeverKing” Quiles, fell to SonicFox twice, but it was clear throughout the match that he was becoming more and more comfortable with avoiding Deadshot’s gunfire. 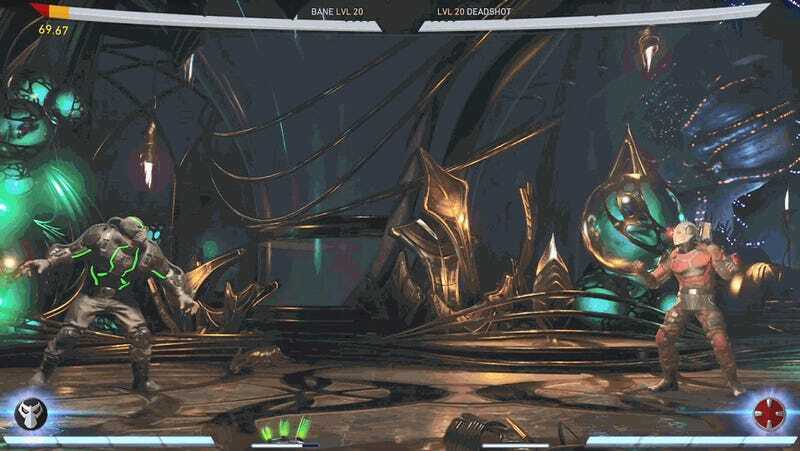 By combining smart movement with Batman’s own projectiles, ForeverKing showed that the reigning king isn’t as unbeatable as he seems, even if it might take a bit more work to dethrone him. Playing keepaway in fighting games is a legitimate skill, no matter how cheap it appears on the surface. The dedication to learning recovery time, maintaining careful spacing, and being able to withstand the opponent’s onslaught should they get into your personal space matches just about any play style you’ll find in serious competition. Deadshot may have a few quirks that make him seem overpowered in the current Injustice 2 landscape, but the tactics the competitive community sees succeed in the early days of a particular release rarely survive the following months. What the developers plan on doing, however, is up in the air. NetherRealm Studios has earned a reputation as prolific fixers through the lives of Injustice and Mortal Kombat X. Where other fighting game creators typically leave larger gaps of time between updates, NetherRealm tends to micromanage. Their previous releases saw regular patching sometimes with only a few weeks in-between. For most players, Deadshot’s nerfing (or “normalization”, as NetherRealm likes to call it), is not a matter of if, but when. Kotaku reached out to Injustice 2 publisher Warner Bros. Interactive Entertainment for comment on this story, but did not receive a response before publication.